I had $1,700 in my pocket that I was supposed to use to pay rent. I wound up not paying rent on time, but that is a longer story than how I used some of that money on drinks last night. So I will tell you the latter. I strapped on my camera and I hopped on my fixed gear bicycle with blue deep v rims and headed over to my colleagues house on Shotwell. My colleague Andrea lives on the corner of Shotwell and 21st. We had a couple drinks before we headed out, but the only way to get her out of the house was with the condition that someone walks her back home later. Our mutual friend Andra, who lives nearby on 20th Street, agreed and we headed out to Benders. They had a $5 cover. No thanks. “Do you want to go to the Lexington?” Andra asks. I hesitate and before I can give a response she decides not to. 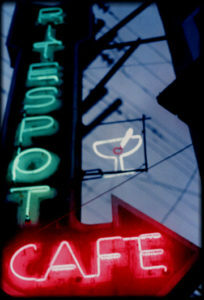 “I can never get any there,” she said, as we agree that the Q-Bar on the Castro is a much better place for that. 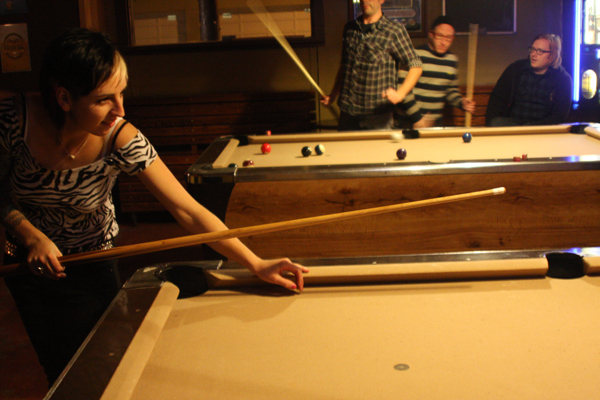 So we headed over to Shotwell’s – no cover and an open pool table. Once there, we see a short guy, about 5-2 with large red glasses, the type your grandfather would wear, and another guy, slightly taller with a receding hairline and a western style shirt. They had come from Benders just like us. Was it the cover charge that brought them here too? I don’t know but one of them had the same rims as mine. Right on. Once inside we go straight to an open pool table where it cost $1 to play. Andrea and Andra are terrible. “How do I do it?” ask Andrea. Andra gives her a tutorial while the guys who had come with us take up a game at the adjacent table. A white pooch walks between the tables, which makes me think of a recent column by C.W. Nevius that said people are abusing service dogs permits. Maybe not this one, it looked well behaved and no one seemed to care. Meanwhile the bartender quickly takes my order, I suppose because it’s still early and there are not that many people yet. In about an hour it begins getting crowded with guys with very little hair on their head and sharply dressed girls. Next to us is Jason, wearing a bandanna on his head and sporting a red foot-long beard. “How long did it take you to grow that thing?” I ask. I could never grow a beard like that I say, stroking my patchy scrub. “How long did it take you to grow yours?” he asks. “Five years,” Andrea says, laughing and pointing at me. Jason is a motorcycle messenger. I don’t know what he delivers, but he left us after the first laugh. As we sit, the guys playing pool hit us several times. “Each time you get closer and closer to my face,” Andra says, sounding increasingly annoyed. We leave the bar and meet another friend who is locking his bike with no less than three locks. We walk near Andréa’s house on 21st and Shotwell, where it smells like weed and urine and five guys no taller than 5-7 are listening to gangster rap. We get some Carta Blanca and Newcastle and head back, but this time we cross the street to avoid the “thugs”. Near Pedal Revolution we pass a guy in all black with a long beard, almost as long as the bike messenger Jason. “Now I know why you wanted me to walk you home,” Andra said to Andrea.